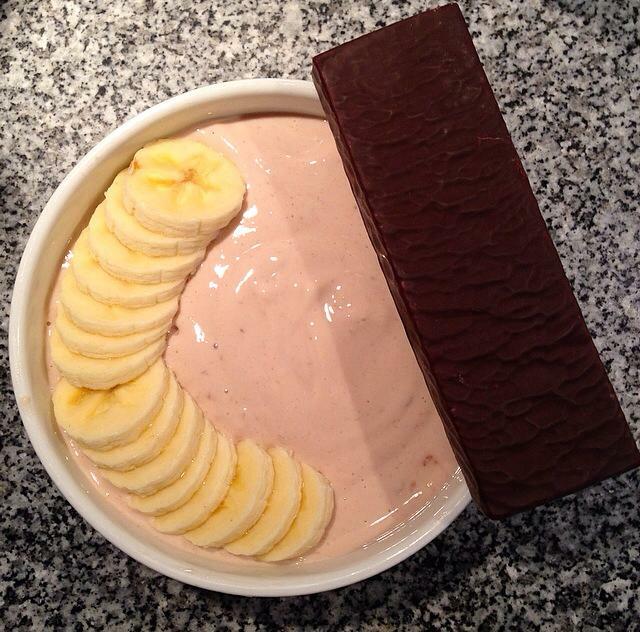 Post Leg day: Banana chocolate dessert! Do you know the feeling after a great leg workout? When walking and sitting suddenly becomes impossible? I LOVE that feeling. I LOVE the endorphins that fill up my body during the last reps. And I LOVE the pain, the shaking and the sweat. My favorite exercise is the squat – today I did like 200 squats! (Back squats, front squats and sumo squats) And of course I also leg pressed (new PR: 125kg! ), used the abductors, leg curled, and did a lot of lunges! Leg day is without drought my favorite day! Topping: The other half of the banana and a dark chocolate/coffee protein bar. Which exercises do you guys do on leg day? 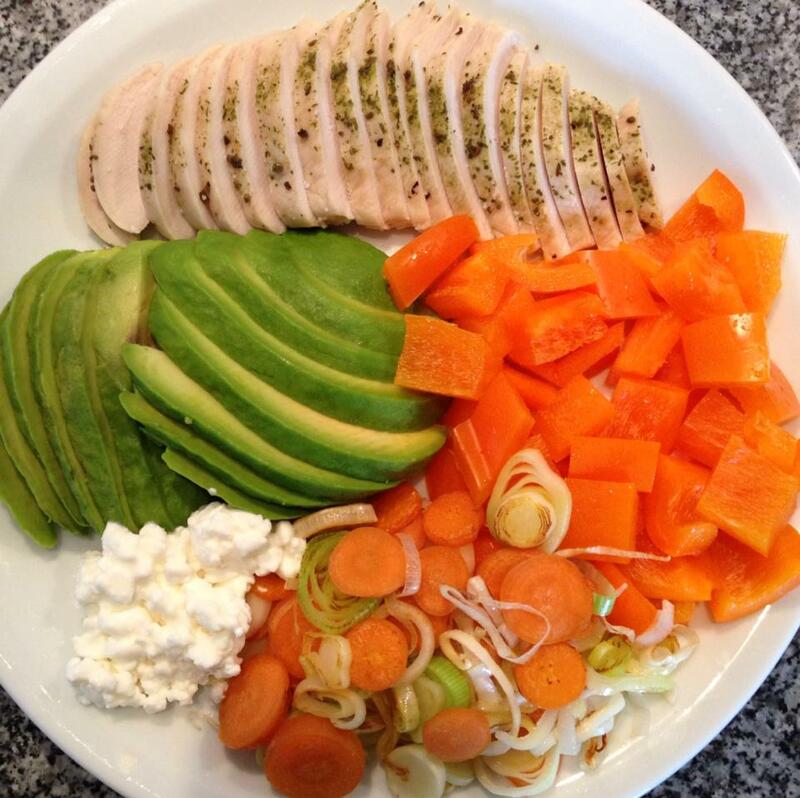 And what do you eat as your post workout meals? I really don’t have time for this, lol. I’m going away for the weekend with my classmates and some other students. We’re gonna party all day and all night long, we’re gonna drink alcohol and we’re probably gonna eat a lot of junk food.. To be honest I don’t want to go. I just want to stay in my bed, eat some dark chocolate and go to the gym tomorrow. Actually I don’t like alcohol and the way people force you into drinking it. It’s like you can’t be a part of the group. So yeaaah sure, I’ll drink have some drinks and lose up a bit.. But I won’t eat the junk! I have brought some of my own food – just as a supplement to the nachos with fatty cheese and white bread. 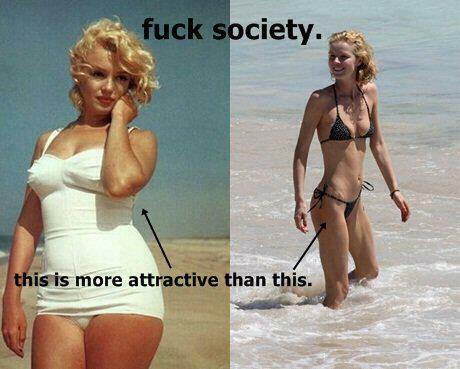 Okay, actually this post is not about my hatred against junk and alcohol.. 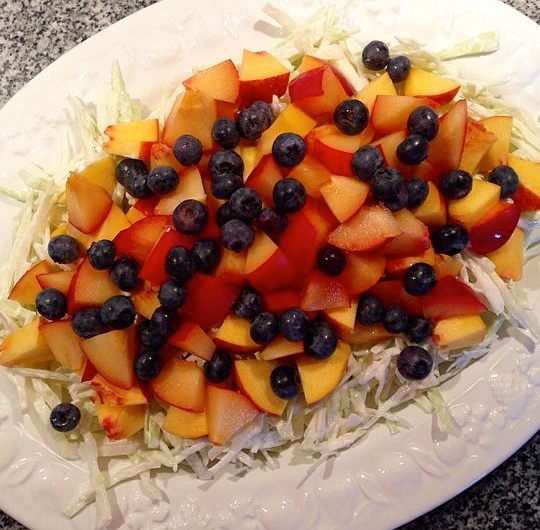 It is about an amazing salad that I made the other day for my family! J So fresh and ymmie! Mix all of the ingredients for the dressing. Then cut the cabbage into small, thin slices. Mix cabbage and dressing and arrange it on your favorite dish. 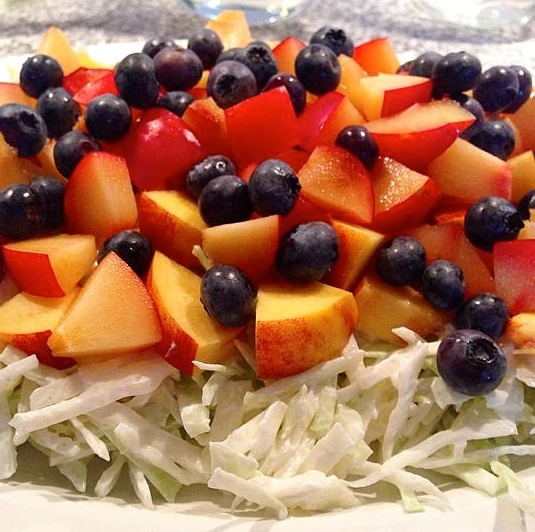 Then top it of with fruit cut into smaller pieces and blueberries. And enjoy! Easy huh? 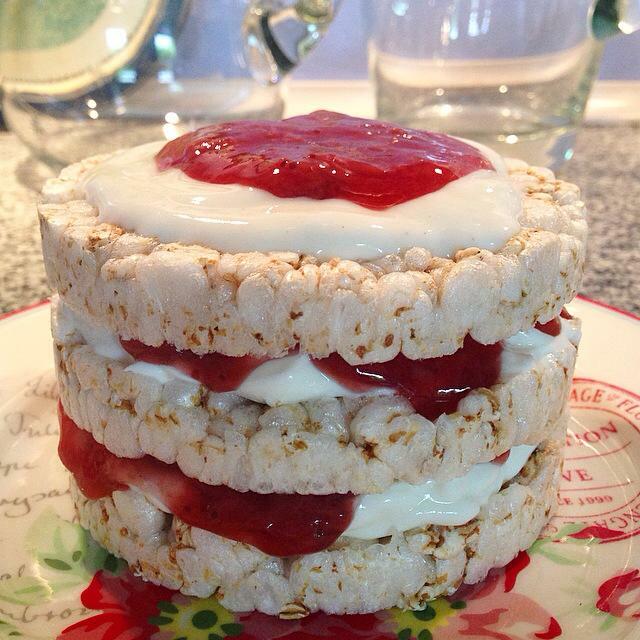 You think rice cakes are dry and boring? Well, think again. 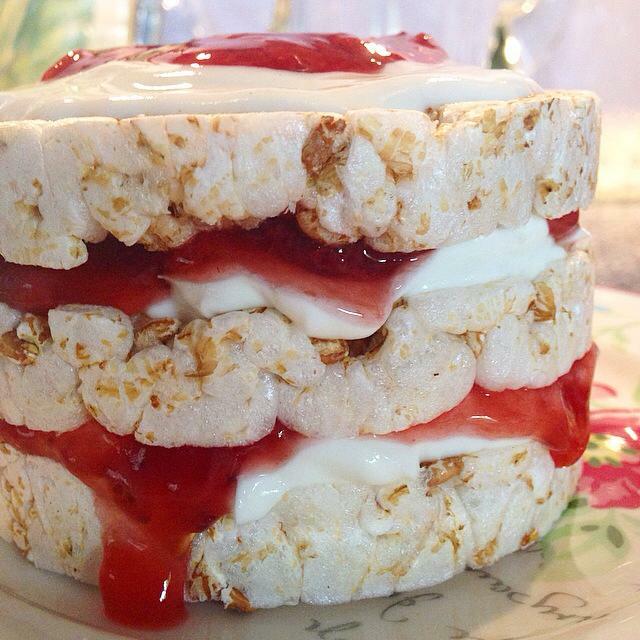 All you have to do is layer them with Greek yoghurt and strawberry porridge and voila! They turn into a delicious cake-ish dessert that is way more fun to eat. I used: 3 rice cakes, 2 tbsp. of Greek yoghurt and 2 tbsp. of strawberry mash – but you can use what ever you like! Seriously guys, try it. It is just much funnier to eat good-looking food and this rice cake thing is so cute, lol. 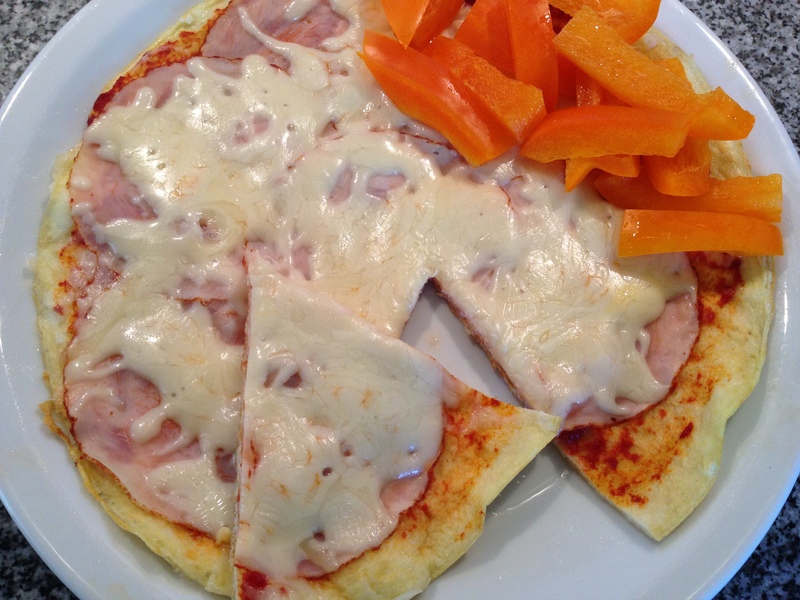 I made this a long time ago, but the recipe never made it to the blog. That is a shame, so here it is! 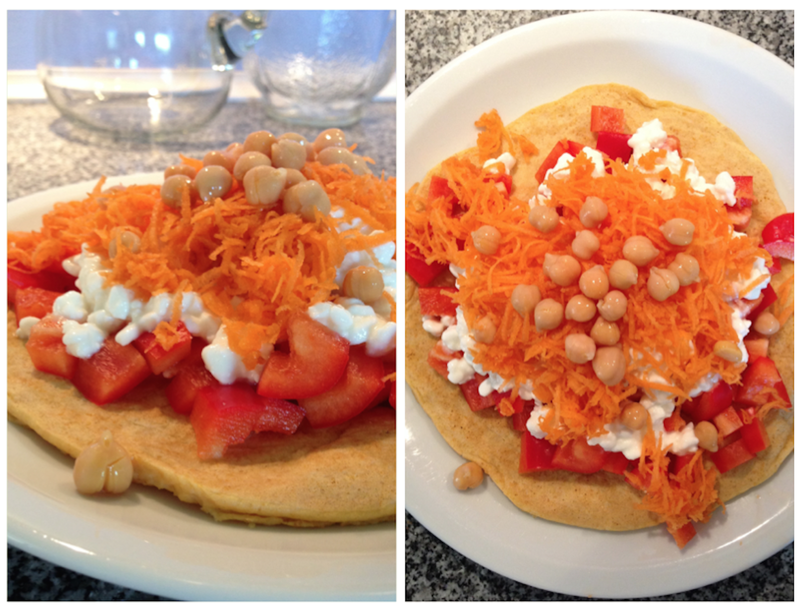 – Toppings: bell pepper, grated carrot, cottage cheese and extra chickpeas. – Blend the egg and the egg white with the chickpeas and the salt. – Cook the mixture like a pancake on a pan (middle heat). You can use some olive oil, so it doesn’t stick. – When it gets a bit structure you can flip it easily.